A small glass of sweet chai and a morsel of the chewy, almost toffee-ish Milk Cake is more than enough to set me back on my way with a spring in my step. 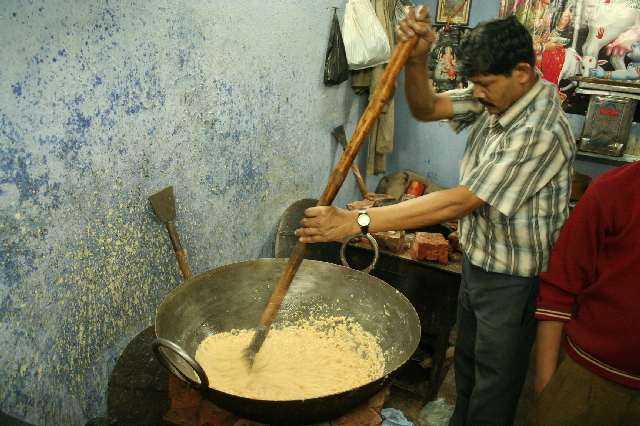 For over 80 years, the Prashad family have been making fabulously frothy chai and Milk Cake in a quiet little gully close to the Bhairav Mandir (also worth a look). The other day, mindful of this year’s mission slipping past me, I asked Anoop Gupta, grandson of Hemchand and the man in charge these days, to talk me through the cooking process. Simplicity itself, as it turned out – as long as you have giant pots and strong wrists. First take 12 litres of milk and mix with a kilo of sugar. Boil, stirring constantly for one and a half hours. Eventually, the mixture will become granular and caramellised. It is then poured into a round cake tin which is put on top of a kettle to steam and set. Great news for my reckless promise to make at home everything I eat on the street – I was delighted to realise I had already made Milk cake, albeit accidentally. While I was experimenting with recipes for Shahi Tukda I reduced the milk a little bit too enthusiastically and ended up with what I now know to be Milk Cake. So that’s another one ticked off, just the small matter of finding time to rustle up Bedmi Aloo, Jalebis, Paranthe, Kulfi Falooda, Aloo Tikki…..and everything else I’ve been gorging on recently! 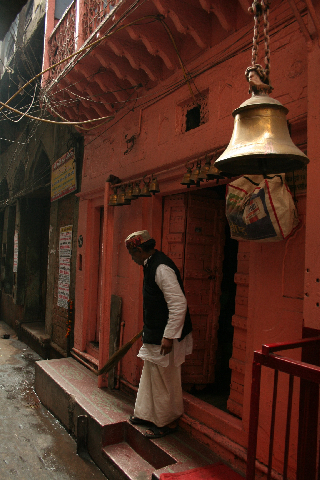 To find Hemchand Ladli Prashad’s tea stall, go into Kucha Ghasi Ram (the last gully on the right side of Chandni Chowk if you’re facing Fatehpuri Mosque) and walk as far as the T-junction with Bhairav Mandir on the left. Turn left and and the shop is a few yards along on the right. Open every day from 8am to 8pm. Twenty rupees for enough Milk Cake to restore va va voom! Lovely chewy sweet milk cake …. I’ve never had it with chai but it’s yummy i know.. I love the way you write Pamella !!! Thank you so much Sangeeta, good to see you here! I’m headed tomorrow to Old Delhi 🙂 :). I just added the milk cake to my itinerary. Another great post ! Have a great time and let me know how you get on! I saw you on Financial Times. Your story in New Delhi is intresting,so,the commercial film” incredible India” is real! Is there an authentic detailed map of chandni chowk available anywhere ? Even Eicher map does not have chandni chowk in detail. Perhaps CC’s mp sh kapil sibal should commission a detailed map showing every kucha, gali and corner of chandni chowk. 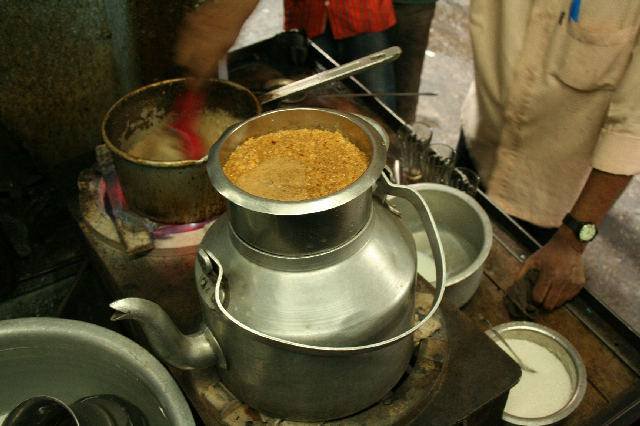 Then we gourmets will not have to torment ourselves over where to find the gems of chandni chowk. I couldn’t agree more – even after 4 years I’m still getting lost in Old Delhi. Perhaps there’s a map making enthusiast would do an Eat and Dust map for us! Thanks Epin – I’m the living proof! Love reading your posts and your photos are awesome. Perhaps you have heard of this already, but there is an event at the IIC on “Raj Cooking and the spread of Indian Cuisine in Britain” on 16 April. DDQ – thanks for your comment – I am planning to attend the IIC event on 16th – sounds interesting! Pamela – I just wanted to say thanks for yet another great Old Delhi gem. I went there last weekend with a freind from Oz who was in town for the weekend. 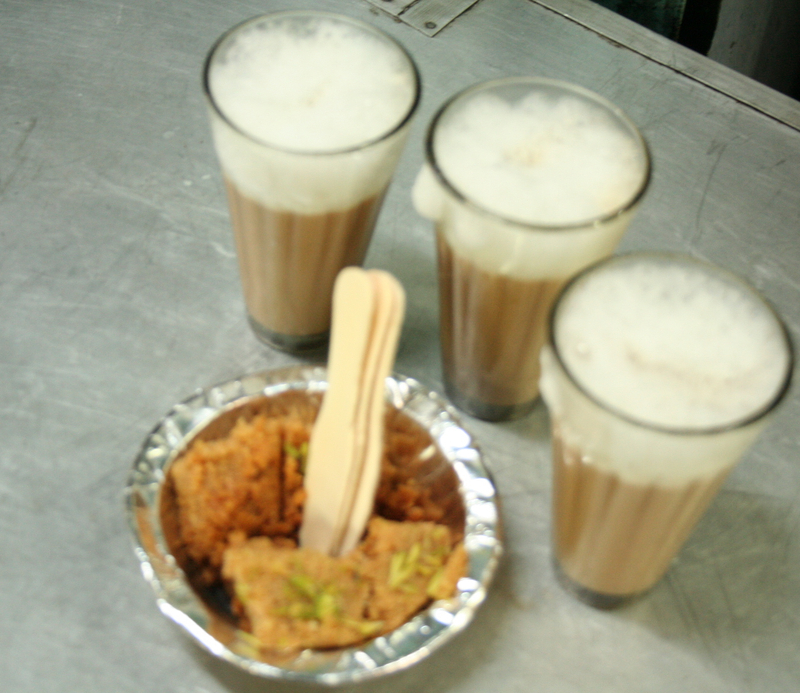 The milk cake and chai did not disappoint – not for the faint at heart where sugar is involved, I loved it!